First Hawaiian Bank will redesign its proposed new branch in Kailua Town after three native Hawaiian remains were uncovered at the construction site. The bank has a long-term lease with Kaneohe Ranch, and is building it from the ground up behind McKenna's Ford dealership. Construction began this summer and is still on schedule to be completed the first quarter of 2009. The existing First Hawaiian Bank, meanwhile, will remain open with uninterrupted service until the new one is completed. Corbett Kalama, executive vice president and Oahu region manager of First Hawaiian Bank, said in a written statement that the contractor found a small, ancient Hawaiian gravesite at the proposed site of the new branch during a property survey. The area measures about 350 square feet, and is on the perimeter of the proposed branch property. "In respect of the site and in cooperation and consultation with Kailua's Ahupua'a Cultural Descendants and the state Historic Preservation Division, the bank chose to move and redesign the proposed branch in order to leave the iwi undisturbed. An appropriate blessing was performed and a marker will be provided for the site." Hal Hammatt of Cultural Surveys Hawaii and Alani Apio, cultural consultant for First Hawaiian Bank, presented these findings to the Oahu Island Burial Council, according to April 9 minutes. The council praised the bank for their cultural sensitivity. A public notice also went out in late April, informing interested parties that these lands were claimed by Queen Hakaleleponi Kalama. The bank -- after consulting with Kailua descendants -- decided to redesign. Kalama was out of town yesterday, and unreachable for additional comment. The remains were discovered in March, and the burial council this month approved First Hawaiian Bank's redesign plans to leave the burials in place, according to Deborah Ward, spokeswoman for the Department of Land and Natural Resources. Ward said the archaeological inventory survey was conducted just for the bank site, and not for the entire redevelopment site, which would include a brand-new Whole Foods Market. If history repeats itself, then a concentration of more iwi are bound to be uncovered in the area, which is rich with native Hawaiian history -- and near a heiau that was surrounded by taro fields and a large fishpond. Texas-based Whole Foods Market has been unlucky in its real estate deals entering the Hawaii market. At the Ward site, which is where its flagship store was expected to open this year -- what originally was reported as 11 sets of iwi remains eventually grew to a count of 64, resulting in protests and a lawsuit from a cultural descendant seeking to halt construction. Developer General Growth Properties was ordered by the state to redesign a planned high-rise condo at the six-acre site, which, to date, has not been resurrected. Whole Foods Market, however, was allowed to proceed, and is expected to open at Ward next year. The iwi at Ward have were reburied last month at a central location at the site during a private ceremony. When a developer encounters bones determined to be more than 50 years, it must notify the state historic preservation division and await further instruction. 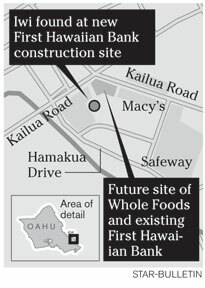 In Kailua, Whole Foods Market plans a 40,000-square-foot store slated to open in 2010 at the site of the old Straub Clinic and existing First Hawaiian Bank. Both plans were announced in July 2007. Landowner Kaneohe Ranch issued a statement saying it has worked hard to "do the right thing" by consulting with cultural descendants, SHPD and the burial council in this matter. Kaneohe Ranch will develop the store to be leased to Whole Foods Market. First Hawaiian Bank, meanwhile, is building a state-of-the-art, energy-efficient branch which will be larger than the existing one. 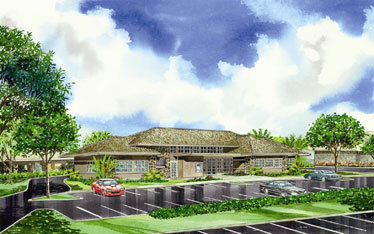 It will offer drive-through teller windows, new private banking and investment services, and an expanded staff. "The decision to move the branch and respect the site was absolutely the right thing to do," said Don Horner, CEO of First Hawaiian Bank. » TheBuzz: "On the Menu"